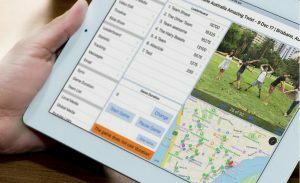 This SMART Amazing Race type program is a high tech state of the art event that uses the latest IPad technology making it cool, fun and engaging. What makes Amazing Chase Smart Hunt so popular? It’s a High-Tech Smart Hunt that engages, bonds and inspires teams! If you are looking for an Amazing Race with a difference then look no further! The Amazing Chase SmartHunt begins with an opening presentation during which teams learn how to navigate the SmartHunts App. 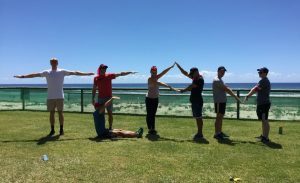 Teams are given iPads® with Amazing Race-type instructions and must analyse the information and clues while developing the best possible strategy to become the champions. After an energizing icebreaker conducted by our facilitator, teams are on their way! Teams will need to think SMART as they set out to find landmarks, solve clues and complete fun photo and video based missions all shot using their iPads. Throughout the race the event facilitator will instantly message teams with live score updates and send them extra bonus missions enabling them to earn more points. As teams complete certain missions, this will automatically unlock in the SmartHunt app hidden missions, further giving teams the chance to earn more points. Throw in GPS tracking/mapping, QR codes, social media and some exciting and unique detours and roadblocks and you have one awesome adventure experience. Upon completion of the event, teams race each other-and the clock- to the finish line where a slideshow of images and videos recorded throughout the day is presented at the concluding awards ceremony. The team with the highest points will then receive gold medals(optional). Whether it’s Brisbane, Gold Coast, Sydney, Melbourne or any location of your choosing, we can run an Amazing Chase Smarthunt anywhere anytime and can even customise and brand the app to your requirements. This team building activity is fun and exciting and can literally be enjoyed by anyone. It doesn’t require any special skills and is highly interactive and has an intensity level of medium. It’s full of fun and adventure and guaranteed to leave everyone with fond memories of the event! Q: WHERE DO YOU RUN THIS PROGRAM? Whether it’s Brisbane, Gold Coast, Sydney, Melbourne or any location of your choosing, we can run an Amazing Chase Smarthunt anywhere anytime and can event customise and brand the app to your requirements. The minimum duration is 1 hour and the maximum duration is 4 hours. Q: CAN THE PROGRAM BE CUSTOMISED? Yes we can most certainly customise the hunt to your requirements for a small fee.